« Yoga with Carrie will be back in January 2015! Our Festival of Trees Donation! 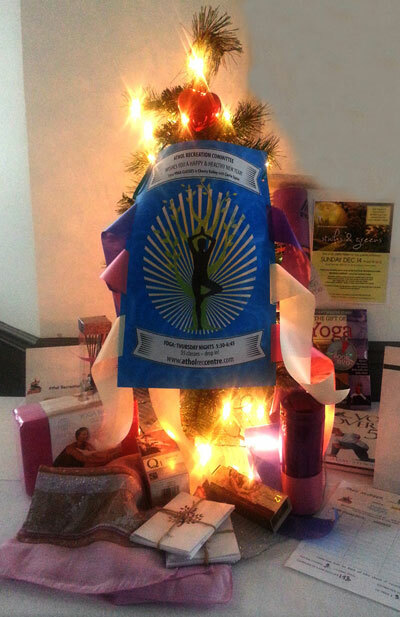 Thank you to our committee members Janet Davies, Carol King and Kato Wake who put together a lovely YOGA tree on behalf of the Athol Rec.Centre for the event. The winning bid was by Helen Fearman at $170. The event was sponsored by the Prince Edward County Memorial Hospital Auxiliary, with all proceeds going to support healthcare needs in our community. Special thanks to our yoga teacher Carrie Taylor for her gift certificate donation and to Sandbanks Provincial Parks for their donation of a 2015 season pass.